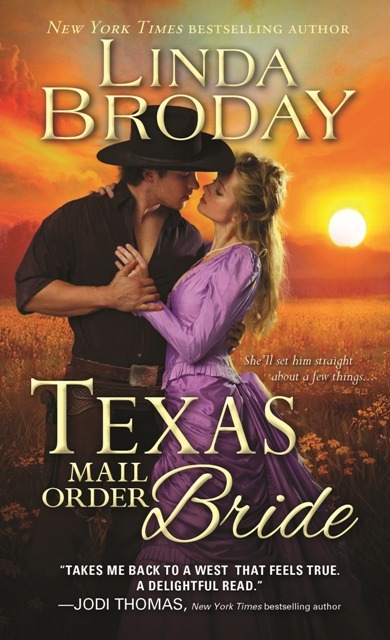 Rancher Cooper Thorne thinks his life is finally on an even keel–until Delta Dandridge steps off the stagecoach, claiming she’s his mail order bride. Brash and quick-witted, the meddling Southern Belle is everything Cooper thought he never wanted…and everything his heart is telling him he needs. But Cooper swore long ago that he’d never marry, and he aims to keep his word…especially now that the demons from his past have returned to threaten everything–and everyone–he holds dear. Finalist in the Maggie Award for Excellence! 2nd Place WINNER! Judge a Book By Its Cover sponsored by the Houston Bay Area RWA Chapter. Delta Dandridge tried to still the tremor in her hands as she stepped onto the porch of Mabel’s Boardinghouse in Battle Creek, Texas. Crisp morning air filled her lungs. Rancher looking for a wife. Must be of sound mind, body, and moral character. That’s what the notice in the Matrimonial Harvest catalog had said. She’d upheld her end of the bargain and could attest with certainty to her exemplary mind, body, and character. That Mr. Thorne hadn’t seen fit to meet her stage yesterday still smarted. Alone, with only a stranger to guide her, she’d taken a room here at the boardinghouse. In a state of collapse, the dark, dreary hotel had sent a sense of foreboding shivering up her spine. Now she wasn’t sure she was quite ready to meet the man who’d agreed to be her husband. Yet, here he was a few feet away. Fortunately, the tall rancher had his back to her, which gave her the advantage of seeing him first. He turned and Delta’s breath caught in her throat. My goodness, he was quite impressive. Tall and lean, there was a rugged quality about him from his chiseled features down to boots that had many miles on them. And a good deal of cow manure, if she wasn’t mistaken. His dark gray shirt stretched tight across his broad shoulders and the black Stetson that shaded his eyes had seen better days. Yet it was the deadly Colt on his hip that gave her pause. He appeared a man to reckon with. Everything about him was hard and unyielding and put her in mind of someone who’d never known any kind of softness. For a moment, it took her aback. She wondered if she could ever please him. “Miss Dandridge, I suppose.” The deep timbre of his voice seemed to vibrate the air between them. “Yes. I’m so happy to finally meet you.” She smiled, covering the few steps with her hand extended. From under the brim of his hat, she glimpsed surprise and something indiscernible in an honest gaze that was the color of gunmetal. White hot anger swept over Delta. It was one thing to spurn her, but calling her a liar made her mad enough to fight. Yanking the packet of letters from her pocket, she thrust them into his hands.